WASHINGTON — Drivers on the George Washington Parkway got their first glimpse of the new traffic pattern north of Spout Run Parkway early Monday, but the ultimate traffic impact from the summer work zone is yet to be determined. 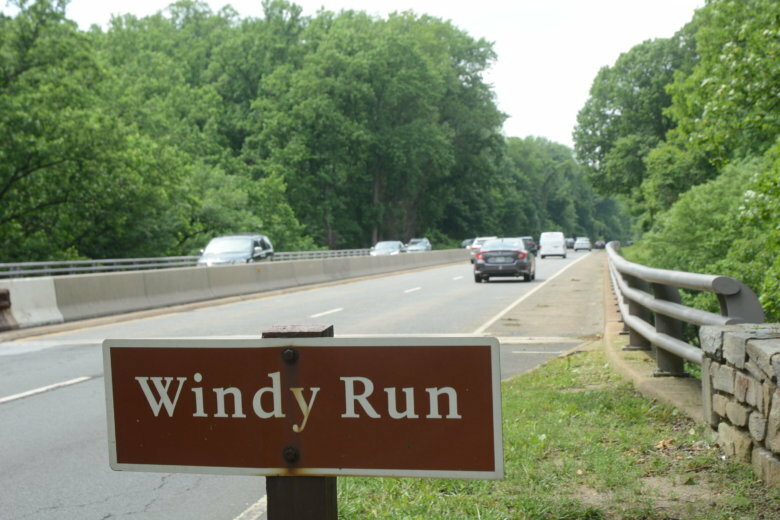 The nearly 60-year-old bridge that carries the GW Parkway over Windy Run will be rehabilitated over for the next several months. Through the fall, northbound and southbound traffic will share three narrow lanes separated by plastic bollards on what would normally be the northbound side. The center lane will be reversible, open to southbound traffic during morning rush hour and northbound traffic from noon to 8 p.m.
“The crossover of the median from ‒ and return to ‒ the southbound lanes is the most abrupt lane shift seen anywhere in a long time,” said Bob Marbourg in the WTOP Traffic Center. While there were no serious crashes reported near the work zone as of late Monday evening, Marbourg and others are concerned about the quick zigzag and contraflow traffic in the confined space. “Beware at night, beware when it’s wet and understand that this really requires full concentration and caution. And of course, always we would hope for courtesy,” Marbourg said. The speed limit has been reduced to 35 mph near Windy Run, but reckless driving is a common problem on the parkway. U.S. Park Police were stationed near the work zone all day Monday and will be on hand during reversals, which are scheduled to occur around 8 p.m. and noon on weekdays. The most intense delays during the morning and afternoon were incurred not by downtown commuters, but rather by drivers headed in the opposite of the rush-hour direction. During the morning rush hour, long northbound delays formed north of Gravelly Point and Interstate 395, under the Memorial and Key bridges toward the work zone where traffic was forced into a single lane, leading to over four miles of slow traffic. The WTOP Traffic Center said that southbound traffic moved relatively well during the morning hours. “Northbound was bad. If you’d gotten somebody from the airport, then you were probably sitting in a big delay to leave the airport and head home,” said WTOP Traffic Reporter Jack Taylor. During the afternoon commute, with southbound drivers reduced to one lane, traffic backed up to Route 123. Northbound drivers began to slow toward the work zone by 4 p.m., and by late afternoon, traffic began to back up from the parkway to the E Street Expressway across the Roosevelt Bridge. Rain may have contributed to the congestion. “It’s summertime. It could completely be different toward the end of the week,” Taylor said. The impacts observed during the first day could be considered a bellwether, but Mondays and Friday mornings, especially during the summertime, often feature lighter traffic compared to other rush hours. As drivers rethink their routes from day to day, changeable traffic conditions should be expected near the Chain Bridge and the Key and Roosevelt bridges, as well as on streets in Rosslyn and freeways in Foggy Bottom. Formally known as the George Washington Parkway until it was renamed in the late 1980s, the Clara Barton Parkway will assume a role as one of the primary — and most obvious — alternate routes around the delays caused by the bridge work on the opposite side of the Potomac River.